Live!Ammunition! was a total success! Berlin. February 6, 2015. My Berlinale highlight was Live!Ammunition! 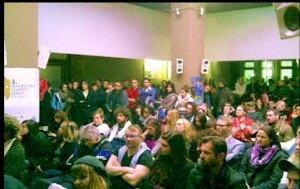 More than 200 filmmakers gathered that night at HomeBase to watch an Open Mic pitching competition. Each of 50 contestants were to deliver their movie ideas within 2 minutes only to convince the panelists, top film executives, to read, or buy the script. 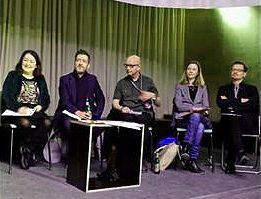 I was among the Jury of seven panelists who needed to comment right away. It was not easy: some ideas were crazy or confused. Luckily we had a fantastic moderator Elliot Grove, founder of Raindance Film Festival and the British Independent Film Awards. He was great with funny, sometimes a bit provocative remarks, which made the audience involved and emotionally charged. We all felt the adrenaline was in the air: some speakers sang, danced or used body language. At the very start each of the Jury members introduced themselves. A US producer next to me was laconic: “I shot many films in Hollywood. So give me your ideas and then I tell you I could buy or I’d rather not buy the script”. I said: “I am producer too. I shot a few films and helped to shoot many int’l productions in Russia. By the way, I am based in Moscow and I am Russian… So, please do not ask me about Ukraine… (Nervous smiles in the audience). And something else: my US colleague will confirm it: some people in Hollywood spend years in court and few of them manage to prove that his/her idea written on the napkin in the restaurant – just 5 lines! – was later stolen for the blockbuster. So, first think well before you intrigue us with your compelling stories, or keep secret about the most important final part”. The winner was Ameen Nayfeh, born 1988 in Palestine, who spent his formative years between Jordan and Palestine. His pitch was ‘200 METERS’ about a man who needs to reach his close relatives nearby across Palestine­Jordan border despite all odds. Here’s a letter from our fantastic moderator Elliot Grove. 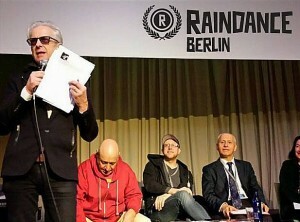 We would like to thank you being part of the panel at this years’ Raindance Live!Ammunition! show in Berlin. More than 200 filmmakers gathered that night at HomeBase to deliver some amazing pitches. It is with no doubt one of the best pitching events we have ever had. We hope you enjoyed the event as much as we did. If you have any feedback please feel free to contact us. 2 Responses to Live!Ammunition! was a total success! It was a real blast – the Live!Ammunition! event. It was especially great to have, for the very first time, a Russion on the panel – so thank you Eugene for your time and timely and wise comments to the pitches.